or potentially treat others in a rude or unacceptable manner. Short man syndrome may also be called “Napoleon Complex”, however both of these terms are not technically medical or psychological definitions. 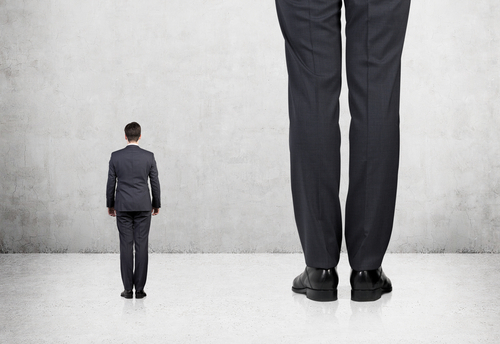 Common social practice is to use this term when someone is mistreated or intimidated by a short man who seems to be overcompensating for his height. However, it should be mentioned that this is a pejorative term, and it should not be used lightly as it may offend people and thus exacerbate the problem. The nature of inferiority complexes are such that when the trigger object is mentioned, the complex may increase and potentially cause negative reactions. The stereotype of short man syndrome can be explained by an example of a short man with a big temper. Likely to be aggressive and domineering, people with this complex may yell, order, demand and otherwise be antisocial. People of this frame of mind are also liable to see offense or personal attacks where there are none. This is similar to someone with extreme acne who responds negatively to any comment associated with acne or even tangential manners, such as hygiene or makeup. In relationships, this syndrome may appear as jealousy, risky behavior or infidelity. While a misnomer, Napoleon Complex is said to be based on Napoleon and his aggressive actions during the Napoleonic Wars. However, he was of average height around that time, about 5’6”. French and English measurement conversations may have been a factor in the spreading of the myth regarding his height. His guards, who he was often portrayed with, were likely chosen for their height and physical strength. Regardless, this term has circulated and has influenced the culture regarding this term. According to psychological understandings, such as those made by Sigmund Freud, short man syndrome may be explained as a ego defense mechanism. Short people may tend to be overlooked, both literally and figuratively. By speaking louder, acting ambitiously and gaining muscle mass, it is certainly possible that this complex is rooted in practicality. Studies have shown that taller people make more money and are more successful in business, and this certainly may have an influence on the way that short men interact socially. Evolutionary psychology also may have a reason for these actions. Smaller, potentially weaker and less able, genetics that produce short statures may also produce higher levels of aggression, ambition and noisiness. These actions would allow shorter people to better compete for mates in the social world. As evolution inherently has deep roots, it is possible that this aggression may have been beneficial in regards to both predators and prey. It is likely that these traits have survived for a reason, so it is likely that the social behaviors may counteract the perceived physical inadequacies of short people. Shortness also may have evolutionary advantages. By requiring less food, shortness may have been valuable during times of famine and migration. This idea seemingly runs counter to the previous statement of evolutionary psychology, so it should be noted that many evolutionary theories are not proven or may exist simultaneously. Because of this, societies of small stature has to evolve in certain ways to combat larger or more dangerous tribes and societies. The evolution of the short man syndrome may be the evolutionary counter to the gentle giant syndrome, that is the perceived and occasional gentle behavior of otherwise large and physically intimidating people or societies. The potential for this syndrome to be a social manifestations may exist as well. As short people may literally be looked over or ignored, it is likely that this syndrome is born of a cycle of feelings of inadequacy. These feelings may cause short people to be louder, more ambitious or rude, and these actions may create positive results for the person. These positive results could create a cycle of positive affirmation and therefore condition this behavior. As an additional result, people may treat or speak to the short person as though they have short person syndrome, which in turn could create additional feelings of inadequacy and a need to feel respected or to act in an intimidating manner. Studies have proven inconclusive in regards to aggression levels in short people. This could be due to the fact that not all short people are influenced by this syndrome. This means that short people, as a group, are not influenced by a genetic marker or objective social interactions. One study, however, has shown that when rapped on the knuckles during experiments, shorter people’s heart rates are more likely to remain steady. It should be noted that studies such of these rarely ensure that participants have the short man syndrome. Rather, other reasons for heart rate stability by be determined. In short, there are few to no studies that create a viable theory in regard to height and levels of aggression. If you, someone you know or strangers in the future have short man syndrome, then it is possible that you may want to know how to take action to produce positive behavioral change. For someone with short man syndrome, it may be beneficial to change the way that you think and feel about your height. It is important to realize that other people do not have negative or otherwise unpleasant thoughts about people of short height. Everyone views their perceived negatives much more harshly than anyone else views them. If these notions of inadequacy or failure are realized as simply notions and not points of fact, then the healing can begin. By removing these negative biases, it is possible reduce and remove the behavioral conditioning that supports the development the such behaviors. Seeking therapy or taking time to become mindful of these actions may be beneficial. Therapy may be a difficult route to take, as these feelings may be worsened because of the potential feeling of powerlessness one may develop when seeing a doctor. However, it is important to realize that some people need outside advice to better understand the workings of their own mind. It may be beneficial to seek treatment, but it may be more beneficial to meditate or practice introspection. Negative though processes may be stifled before they begin with proper mental cultivation. By realizing which triggers cause which feelings, you can better determine how to not create negative emotional and social interactions. For others, it is important to realize that people may have negative feelings about themselves. These feeling may or may not be rational, and these feelings may be rooted in previous experiences and behavioral feedback. Take care not to speak or act in a way that triggers negative emotions. Likewise, it is important to be mindful of your behavior as to not cause negative emotional or social interactions. If you find yourself looking over or ignoring a short person, then correct your behavior. If you find yourself talking in mixed company about how strong, handsome or powerful someone else is, then perhaps it would be beneficial to change the course of conversation. At all times remain conscious of how your words and actions may harm or help others.